LeWitt never touched this ceiling; there is nothing of his handcraft in its production. Rather, what was important to him was the idea--he was an early pioneer of conceptual art. In 1982, the Philadelphia Museum of Art purchased this wall drawing, which means simply that the Museum owns the idea and the right to execute it or to erase it and to allow others to do so, as expressed in a certificate signed by the artist. LeWitt provided the description that is the work's title and specified directions (how many coats and what brand of paint, for example), but the execution of the wall drawing was left to the hands of others. In the mid-1960s, Sol LeWitt emerged as a leading figure of Conceptual art, an international movement that emphasized a work’s originating concept rather than its resulting materialization. Known initially for his geometric sculptures, in 1968, LeWitt began to draw directly on the wall, first in spare black pencil lines and later in washes of saturated colors. For these “wall drawings,” the artist created a set of instructions that could be followed by museums and private collectors in creating the works, making his role, as originator of the idea, similar to that of the composer of a musical score. LeWitt’s wall drawings differ with each installation, or “performance,” as they are adapted to the characteristics of the specific site—variability the artist embraced as a necessary part of his art. The drawing at the Museum appears on the ceiling and end walls of a barrel vault, a setting evocative of the orderly and contemplative mood of a frescoed chapel. John B. Ravenal and Adelina Vlas, from Philadelphia Museum of Art: Handbook. Philadelphia: Philadelphia Museum of Art, 2014, pp. 390–391. In the mid-1960s, Sol LeWitt emerged as a leading figure of Conceptual art, an international movement that emphasized a work's originating concept rather than the resulting object. Known initially for his geometric sculptures, in 1968 LeWitt began to draw directly on the wall, first in spare black pencil lines and later in washes of saturated colors. When a museum or a collector buys a piece of Conceptual art such as a wall drawing, the "object" the purchaser receives is a set of instructions for installing the work. The artist's role as originator of the idea is similar to that of the composer of a musical score. The wall drawing will vary with each installation, or "performance" as the characteristics of the work are adapted to the specific site. LeWitt welcomes this variability as a necessary part of his art. 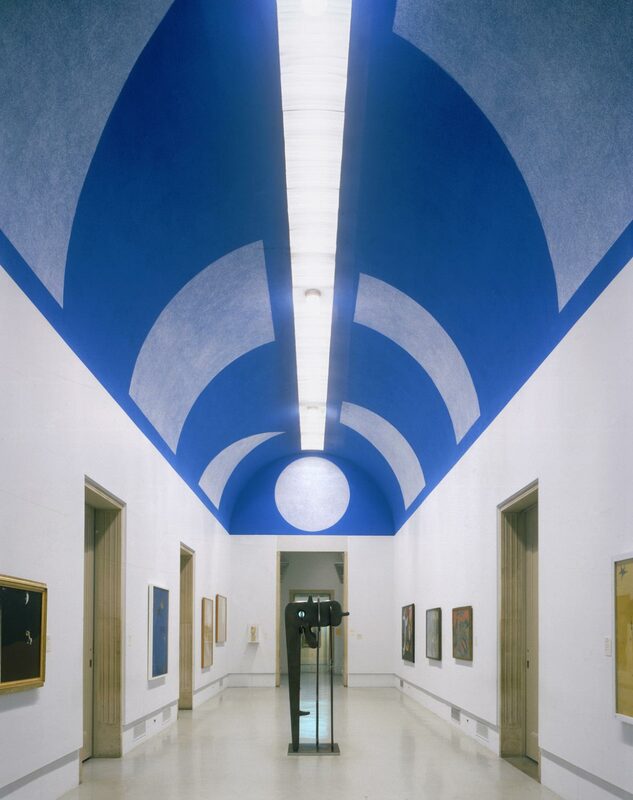 The "incarnation" of LeWitt's work at the Museum appears on the ceiling and end walls of a barrel vault. The happy convergence of the vaulted architecture, the lush blue hue, and the chalky white purity of the geometric forms evokes the orderly and contemplative mood of a frescoed chapel. It is perhaps no coincidence that LeWitt was living near Assisi in Italy when he conceived this work. John B. Ravenal, from Philadelphia Museum of Art: Handbook of the Collections (1995), p. 343. This wall drawing is described fully by its title, although the words give no clue to the work's joyful presence. Designed by Sol LeWitt in April 1981 specifically for the gallery it occupies, the work was produced by a group of LeWitt's assistants and Museum staff members. The following year the Philadelphia Museum of Art purchased the wall drawing, which means simply that the Museum owns the idea and the right to execute it or to erase it and to allow others to do so, as expressed in a in a certificate signed by the artist. LeWitt made his first wall drawing at the Paula Cooper Gallery in New York in autumn 1968. His invention was one of many radical artistic assertions that coincided with a cataclysmic art historical moment. It was an art resolutely opposed to the commercialism surrounding painting and sculpture, distrustful of the asesthetic value of permanence, and allied more closely to philosophy or sicence than to decor. LeWitt's early wall drawings were done in thin graphite lines that subtly but authoritatively altered surfaces. Over the decades, as his work gradually abandoned the need to present a restrained appearance in order to prove its intellectual basis, his wall drawings have evolved into lively, lush painted designs of bold shapes and colors. LeWitt's revolution was manifold, transforming modern drawing from a small-scale format subservient to painting or sculpture into something grandly autonomous. Perhaps most radical was LeWitt's disassociation of the creation of an idea from the execution of a work of art: while the instructions are indisputably his, the manufacture need not be and usually is not. As the artist points out, the wall drawings, like music, will be done differently by every interpreter. 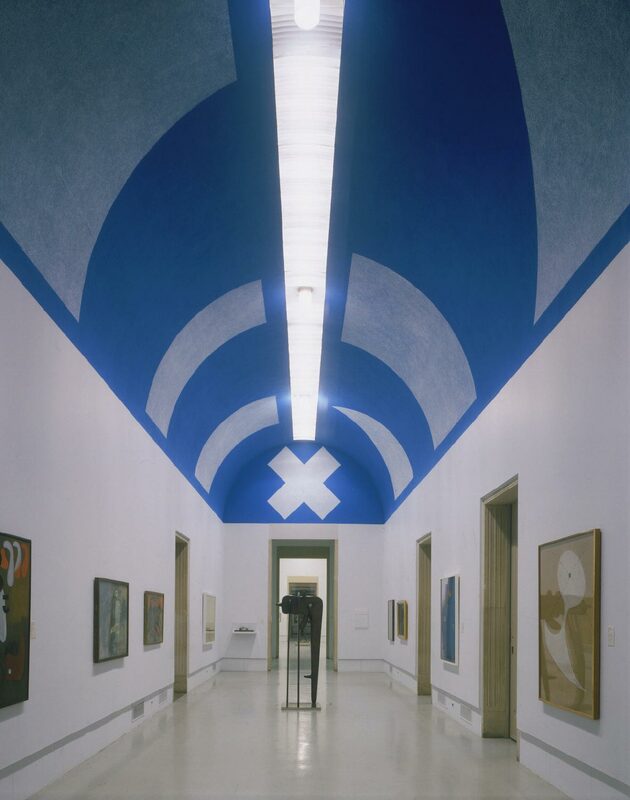 Despite LeWitt's specified presecriptions (how many coats and what brand of paint, for example), On a Blue Ceiling draws its strength from the individual spirits and hands of its team of makers. Philadelphia Museum of Art: Twentieth Century Painting and Sculpture in the Philadelphia Museum of Art (2000), p. 127.